This is a composite picture stitched together by Windows Live Photo Gallery from a dozen or so photos taken on my new Nokia 6303i phone. 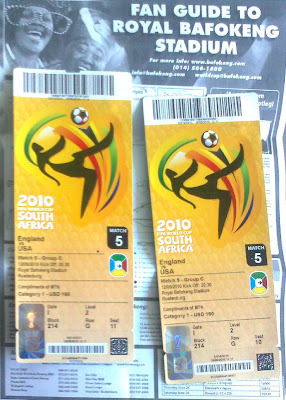 I took them at half time in the England-USA match at Royal Bafokeng Stadium on 12th June 2010. The match was a 1-1 draw, and quite exciting. There was a great atmosphere in the crowd, spoilt only by the insane loudness of the Vuvuzelas. Fortunately we had good earplugs so we managed to preserve our hearing and not get a headache either. The inset on the left shows a picture of a modified Vuvuzela that has to be the longest I've ever seen. The inset on the right is Penny doing her best to drink a Badweiser beer. If you look at the details of the picture you'll notice how many VIP seats are empty/unsold, and you can also see the non-functional TV screens on the left and right of the stadium. In spite of the deafening noise, the overpriced beer and not being able to see the replays, we had a great time. Everyone was in a good mood, and even though the US fans were completely outnumbered, their shouts of "U-S-A U-S-A" could be heard above the din, and made the mood pretty festive. The US team played well, but didn't seem to be able to finish off their attempts at goal. They were very sporting, and acknowledged their fans at the end of the match. I'm glad I supported them and hope they go on to the next round, even if their home country has no idea how well they did. Logistics have never really been a strong point in South Africa, and the official FIFA web sites provided no useful information on how to get to the stadium. The map in the fan booklet is laughably bad. 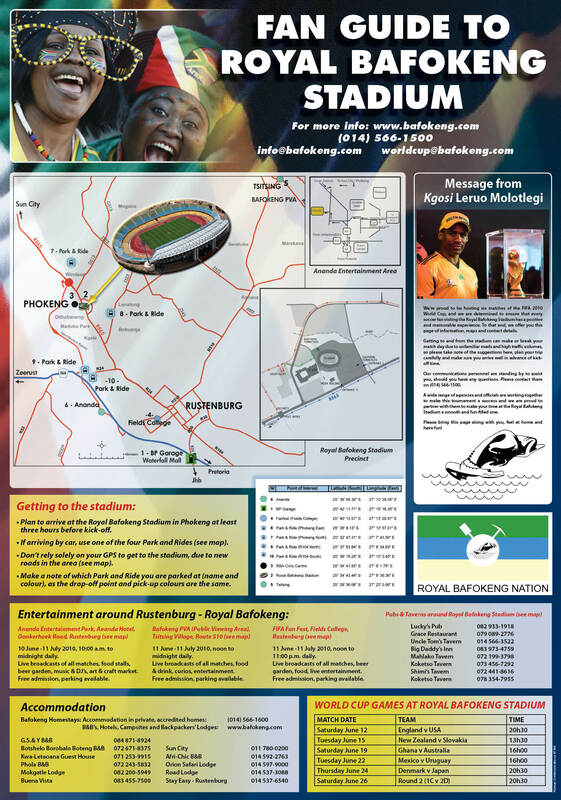 But there is a great graphic and information provided by the "Royal Bafokeng Nation" web site. I printed it out and it is shown behind the tickets (above). As it turned out the route to Sun City is well marked, and in combination with the directions to our hotel, we arrived safely and on time to check in at the hotel. A very helpful lady from the Rustenburg Accommodation and Tourism Association suggested we try the Sundown Ranch Hotel. I'm glad we did. The cost of the stay at the hotel was less than the cost of a single FIFA ticket. And it included breakfast for two. Fortunately we didn't have to pay for the tickets (thanks to MTN who gave two to a friend of ours) and we have avoided buying anything with the FIFA logo on it, except for the food and drinks at the stadium. Who to Support? England? USA?